It might be spring. I keep telling myself that, as I wander the streets of New York. Now that my restaurant, In Fashion, has closed, I have taken to walking by it every day, pressing my nose to the papered windows and wishing things had turned out differently. That can't be healthy. I needed a dose of good, common sense, so I naturally turned to Nana. My mom's mom, Rose Freemont, lives in Gracious Grove, New York, a medium sized town near Seneca Lake, in the Finger Lakes area of upstate. I hardly knew my dad's parents; they passed away years ago. My mother's father died a long time ago too, but Nana soldiers on, running Auntie Rose's Victorian Tea House. I gave her a call. Rose Freemont: My Sophie! How are you, darling. You sound sad. Are you okay? How could she tell that just by me saying 'Nana'? Sophie: I'm fine. Just... bored since In Fashion went belly up. Rose: Come visit, and I'll put you to work. She was joking, or was she? I worked in the tea room every summer while spending most of it in Gracious Grove with her, the very house my mother grew up in. Gracious Grove in the spring is lovely. But... no. I need to find an actual job, I thought. Sophie: I'll come visit some time, but right now I have to find a job. They're not easy to come by. There seems to be another restaurant closing every time I look around. In Fashion was just one of hundreds. I just wish... I wish the investors had given it a real chance. Rose: Don't give up, sweetie. 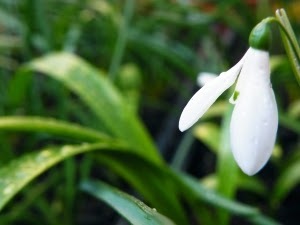 I saw a snowdrop today. It gave me hope. It's been such a long, long winter. She sounded tired, and my heart squeezed in my chest. Nana rarely complains, but she doesn't see much of us, her family. I don't know why Mom avoids Gracious Grove; she and Nana have a pretty good relationship. But Nana once told me the moment Mom left to go to college, she knew her daughter would never be back to stay in GiGi, as the locals call the town. I love the place. Heck, I'd move there if I could, but that is just not practical, not for a fine dining chef. GiGi is a sweet town, but there are no real upscale restaurants, and probably never will be. Most foodies like wine, and Gracious Grove is one of the last 'dry' towns, a place with no alochol served without the town limits. Sophie: I promise I'll come visit for a few days as soon as I figure out what I'm doing. Rose: All right, my Sophie. I won't plague you any more. But you know I'm here, if you need me. As I hung up I thanked my lucky stars. It was true. I could always count on Nana to cheer me up. I felt a little better, and determined to get up bright and early and keep looking for a job. Someone in NYC had to want a chef with some talent and a lot of energy and ambition! Have you ever been in a spot like that, where you get so down you just can't pick yourself up, so you turn to the one person who can cheer you? Who is that for you? Hello, all! 2014 is shaping up to be such an exciting year for me. 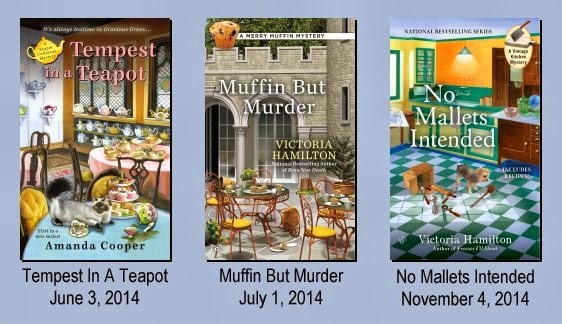 I have three (or four) books out this year... how three - or - four? Well... not long ago I got an email from my agent, and she told me about a cookbook coming out from Berkley, with recipes from several cozy authors.Would I like to be one of them, she asked? You can imagine my response.. of course! 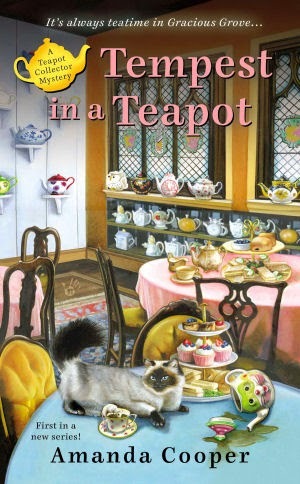 So, they say it will be out in April, and as soon as I have a cover I will share it! Here are my three releases this year.